The New COM3000 Headend by Technicolor is the latest in a line of revolutionary headend television systems from DIRECTV. It is the smallest and most powerful headend TV system available for hotels, rv parks and campgrounds, assisted living facilities, senior living facilities, healthcare, campuses, institutions, bars, restaurants, and other commercial applications. In 2009 Technicolor released the COM1000 for DIRECTV Hotel TV Systems. The COM1000 was a revolutionary HD headend system when it was introduced and changed the way TV for hotels was provided in hotels with over 250 rooms. It provided hotels with a cost effective, single wire system. The COM1000 Headend was designed to lower the per channel costs of delivering HD television programming, decrease the space needed, and add more HD channel capability. The COM1000 allowed you to have up to 24 channels in a single 4U chassis. Before the Com1000 was introduced in 2009, upgrading your Hotel TV system to HD was a costly, disruptive process for hotels. It was even more difficult for hotels and resorts with over 250 rooms or that do not have home-run type cabling throughout the property. Before the COM1000 for properties using an existing analog headend a huge worry in upgrading was the downtime required in switching to HD because a property needed a complete re-wire because of a lack of home run wiring or because the new system required installing set-top boxes in-room. It’s a very real concern, because in a 24/7/365 industry you’re talking about disconnecting TV in every single hotel room. Shutting down rooms is a major cost over and above the cost of the new TV system itself. The COM1000 provided a plug and play hotel television platform that minimized downtime and dd not require leaving rooms vacant for installation. In June of 2014 DIRECTV and Technicolor announced the COM2000 HD headend system. The COM2000 was a quantum leap forward in technology that brought along with it the plug and play platform and stability of the COM1000 while adding some outstanding new features. The Com2000 continued DIRECTV’s leadership in commercial-grade TV system solutions for the hotel industry, hospitality, healthcare and for other lodging and institution properties. It allowed you to have up to 48 channels in a 3U chassis the size of a desktop computer laid on its side. But with Hotel television programming packages from DIRECTV often including 100 or more channels, the COM2000 still had limitations. To provide your guests with a full package of channels they expect in your rooms because they have them at home, hotels and other lodging facilities were forced to stack COM2000 chassis to provide all the channels. The COM3000 Headend takes the next step in providing the TV experience Hotel guests are clamoring for. AT&T continues to change the world of video with the launch of COM3000. This is the third generation of our DIRECTV for Business video headend. With it, businesses will get more channels than ever. Plus, they’ll find it’s easier to customize. COM3000 Headend can deliver up to 138 HD channels, including 4K HDR programming. And business owners can add channels one at a time, including their own in-house and over-the-top (OTT) channels. The 1st thing you will notice is that the COM3000 provides true 4K TV. COM3000 will support DIRECTV’s current 4K channels as well as the HDR and high-bandwidth programming of the future so its truly futureproof. Since the COM1000 was introduced for use on DIRECTV Hotel TV Systems, the competition has tried to copy it. Even expanding on the number of channels available in a single receiver card. 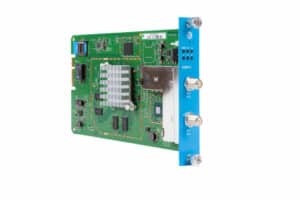 Technicolor has packed access to up to 23 channels in a single COM51A receiver card. Like the COM2000 access to the NEW Technicolor COM3000 headend is via a web browser, meaning that if channels need to be changed, service needs to be done, or you want to utilize channels to provide welcome screens and local information, it can all be done remotely. When you call Barry at Its All About Satellites for DIRECTV for your Hotel or Resort, remember to ask about how you can use the COM3000 to control the TVs in your bar or restaurant. A compact headend like Technicolor’s COM system is the perfect replacement for expensive AMX or Crestron controllers as a way to supply DIRECTV satellite service to a bar or restaurant or anywhere you multiple TVs. 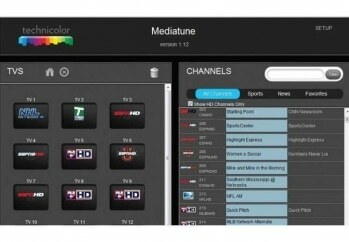 The COM3000 MediaTune competely solves Bars and Restaurants biggest problem with multiple TVs…changing the channel. Until now, the only option Sports Bars and Restaurants had for controlling multiple TVs with a single remote device was an extremely expensive matrix switcher with a AMX or Crestron controller. Otherwise you were stuck with a box of remotes, each one for a different receiver. Control all of your TVs from one web interface. From your computer, iPad, or even your smartphone. You can even use locally generated channels to advertise events and specials in your bar. The Technicolor MediaTune COM3000 headend gives you the flexibility to access it from any web enabled device. In other words a PC, a laptop, an iPad, or even your iPhone or smartphone. It’s so simple to use, drag and drop, that any of your staff can be trained in its use in just a few minutes. *U.S. domestic satellite TV industry. AT&T has introduced an upgraded version of DirecTV for business customers, including hotels, that features a large lineup of HD channels, 4K capabilities and multiscreen access. The third-gen platform, called COM3000, supports up to 138 HD channels (along with select programming in 4K and HDR formats), and lets business owners tack on their own in-house and OTT channels. In addition to TVs, COM3000 is also capable of supporting smartphones and tablets, select smart TVs and third-party set-top boxes. The service can also be delivered on a range of access infrastructures, including coax, Ethernet and WiFi, AT&T said.